This dates from 1950 or 1951. Can you put names to faces? 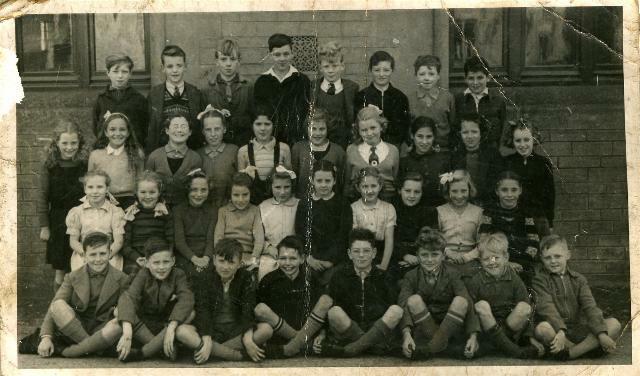 4th left front row could be Alastair Maclellan (spelling? ), now resident a few doors down from Marine Hotel?? Yes, positive id of Alistair. I still correspond with him - busy working his croft now. Is that Martin Legge fourth from the right back row? 1st on left, second row could be my mother, Rosalie Graham - would that sound about right - she was born at the end of '39? Back row (left to right): Williamson?, Hamish Urquhart, George Russel, Arthur Scott, Martin Legge, Willie Macleod, John Ross, Gordon Wills. Second Row from top: Catherine Macleod, Jinty Mackintosh, Carol Duff, Norma Douglas, Helenette Farquhar, Ishbel Mackenzie, Jessie Stewart, Ishbel Clark, Seonaid Macdonald. Third row from top: Rosalie Graham, Ann Macleod, Terry Walker, Helen Archibald, Daisy Ross, Sheila Morrison, Margaret Mackenzie, June Ross, Amelia Muckle. Front row: Jimmy Lyall, Iain MacPhail, Robert Gillies, Alister Maclennan, Harry ?, John Young, Daniel Macdonald, Kenneth Maclean. Hello Amy - is it you who used to live in Clyde Street and bought the house at Balantraid Pier? We have many happy memories of the Pier, as my great-Aunt Jessie Ross and Uncle Tom the Ironmonger lived there from the 1920s for 50 years or more. Auntie the Pier was very proud of her garden, with its gooseberries (including the prize bush which only the Minister ever got to try, and heaven help any of us who pinched a gooseberry from it! ), the strawberry beds, the shed at the bottom with the chickens in it, the toilet which had to be emptied into the sea off the pier, and the neatly clipped box hedges. I can't imagine how all of us used to squeeze around the table for tea on Wednesdays, a regular appointment not to be missed. Auntie's door was always open to visitors, who came from far and wide. As a child in the 1960s, I was sent out to play, come rain, shine or more often wind, and would find a sheltered spot behind the pier to read a book - not what I was supposed to be doing and considered unnatural for a child! Occasionally (in a really bad storm perhaps), I'd be allowed to read in the tranquil front room, kept for best for visitors, with no sound but the tick of the carriage clock on the mantlepiece. That room is one of the most peaceful places I can remember. My mother (Jet Andrews) says that she was a neighbour of Mrs Ross, Reta and Nana in Clyde Street and knew them well. She sends her regards. Hello Caroline, just found your comments - yes it is me, and Maureen Borley and I are still friends. In fact I was with her today at a funeral unfortunately, but Maureen and I now do the recording and cataloguing at the museum and come across a lot of old photos, so ask Jet if she has any, we can scan them and return them, Maureen and I hope to do a feature on old faces of Invergordon. I remember Mrs Andrews very well and still have some glasses she sent to me in 1960 when I got married in Swindon. My mother died last June and I miss her very much but she had dementia and unfortunately was always looking for me even when I was sitting with her. It is so nice of you to write and next time you are up come and see the house, although you will see big changes because we built a bungalow at the bottom of the garden for Mam and Dad just where your uncle Tom had the henhouses and garage, but unfortunately Mam and Dad only had two years there. I remember Auntie the Pier very well because when we were young Maureen and I used to visit and swim off the pier and have picnics in the garden. It would be lovely to hear from you again and thanks so much for writing. Love to Jet. That certainly looks like Alistair MacLennan although I did not know him until he was around 21 years of age! His parents stayed at number 13 High Street Invergordon, and we (the Booths) stayed at number 15 High Street. I am shortly putting a photograph on this site of Alistair and I, plus his parents, Sandy and Nellie (?) when I visited his parents in Invergordon in 1973. The girl between Helen Archibald and Sheila Morrison is me, Janet Macpherson, not Daisy Ross. Yes, that's Alistair Maclennan - I thought he lived bottom of Bank Street opposite the Macraes. You are right Gordon, but the family moved, also the house opposite was demolished quite a few years ago. That should be Alistair Maclellan, whose father was Sandy who worked on the pilot boat. Just realised that I am sitting between Helen Archibald and Daisy Ross. Sorry for my mistake. Hi - I have some questions that maybe Caroline Robb and Amy Seaton can help me with regarding "house and garden" at Balintraid Pier and about the Balintraid Pier area itself. I am a descendant of the Ross family who lived at Balavack, Delny, Invergordon. Two of my Great Grandfather James Ross's siblings had connections to Balintraid Pier. His brother Charles Ross (married to Elizabeth MacKenzie) lived at either Balintraid or Balintraid Pier from the time of their marriage in 1887 until some time around Charles Ross's death in 1895. Charles and Elizabeth had four children - the youngest Charles is listed as having been born at Balintraid Pier in 1896. This Ross family also had connections with properties in Saltburn with the names of Fairview Bungalow, the Shieling and Lindean. Catherine Ross Birkens a sister of my Great Grandfather James lived at Balintraid Pier at the time of her marriage in 1913 and though she lived in Inverness with her husband William Birkens after the marriage she is also listed as the proprietress of a house and garden at Balintraid Pier in the 1915 valuations occupied by a Margaret Munro. 1) is there more than one house and garden at Balintraid Pier? 2) Do either Caroline or Amy or anyone else know anything of my Ross family connections to Balintraid Pier? Though I am aware of the Ross family in Barbaraville (the family of the Jessie and Tommy Ross you mention), so far I have found no connections between the Barbaraville family and my Ross family at Balavack. Thank you very much in advance for any information. Growing up in the 50s in Invergordon, I was aware of Gilbert Ross, the iron monger on High St. He lived at Balintraid pier, opposite the entrance to Pollo Farm. Perhaps some confusion in the last post. Tommy Ross who ran the ironmongers shop lived at Balintraid with his wife Jean. The business was owned by Gilbert Ross who also owned two ironmonger shops in Inverness where he lived. Well spotted. I should have checked before pressing Send. That is why we were punished for carelessness at a tender age, but I fear it was quite useless in my case!